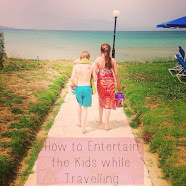 Struggling to get the kids to eat their fruit and veg? You aren't alone! Carving food into something more appealing really helps to encourage them to tuck in though and that's exactly what we have been doing this week with the Thomas Kitchen knives from Tesco! Slice your apple in half straight through the core. NB if you are preparing this in advance for a party or lunch box, use lemon juice to keep the apple fresh and to prevent it changing colour. This was very simple to do so ideal for a novice or someone worried about handling knifes in particular. The Mini Mes were even more keen to eat their fruit than usual when presented as a cute animal so it's certainly worth a go. If you fancy recreating this idea or making something even more intricate then get you can pick up your own knives from Tesco today! 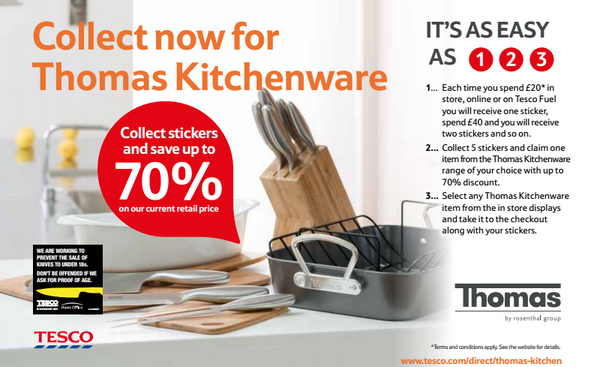 Tesco are running a sticker promotion between 3rd March – 1st June 2014 where you can save up to 70% on exclusive kitchenware products at Tesco. For every £20 you spend online OR in-store you can collect a sticker, once you’ve collected five stickers you can use these to save up to 70% off professional kitchenware items. For more information on the campaign you can check http://www.tesco.com/direct/thomas-kitchen/ for more details! For your chance to win a Thomas Knife Kit of your own you can enter via the Rafflecopter entry form below. The giveaway closes on 21st April 2014. 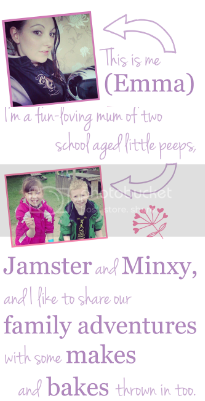 *This is our entry into the Tesco Blogger Challenge for the chance to win a £150 Red Letter Days voucher. Looks a gorgeous little tortoise thank you! I follow by all mentioned in your Rafflecopter thank you! Ooh I absolutely LOVE this - so cute! This is brilliant! Love your tortoise! My favourite fruit is strawberries. My favourite fruit is grapes. You can't beat freshly picked raspberries! I could graze on cherry tomatoes all day! I would go with bananas but to be honest I love all fruits! I've never saved up the vouchers but they always look like a good deal. I'd love to win, I am loving berries at the moment. I love fruit and veg carving and this looks great. My favorite's got to be tomatos as they are so versatile. My favourite vegetable is broccoli. Definitely got to be butternut squash - Roasted, it can't be beaten! Followed on Pinterest and Bloglovin' (lorraine stone). Love mushrooms, esp on toast. Mangoes are my favourite fruit. I'm following you on Pinterest as Stephanie Cheung-Tsang. I should choose the potato as my favourite fruit or vegetable. I eat them almost every day, in one form or another. However, that answer feels a bit cheaty, so instead I will choose the tomato. It is such a versatile fruit, so many recipes require it and I simply like the taste of them. Bananas - I eat far too many! Persimmon is my favourite fruit, only discovered it last year and was heartbroken when the season ended! I love fruit and eat loads of it but I'm looking forward to persimmon turning up in the supermarket again! I love sweet potatoes!! Yummy! Aubergines. I use them all the time. i love really ripe bananas! Strawberries, I'm allergic to pretty much everything else! Strawberries - with a pinch of black pepper. 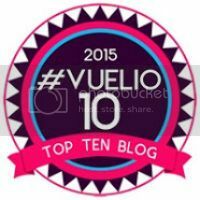 Already following.... Bloglovin. Emma Nixon. 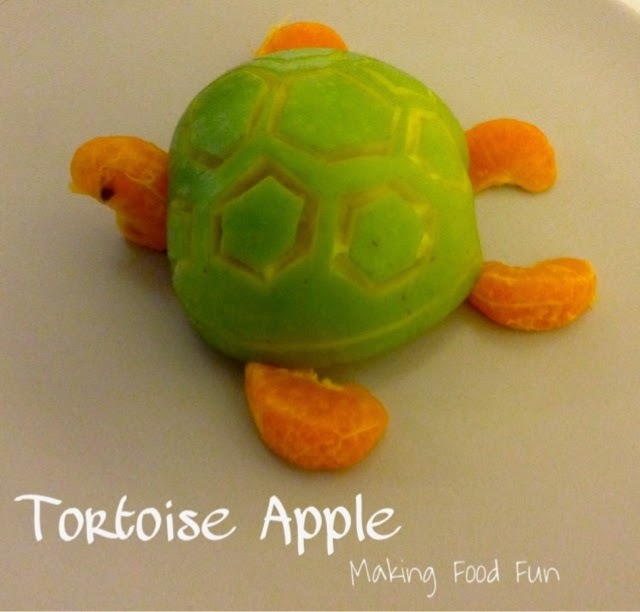 And awww your apple tortoise is adorable! Following on Pinterest & Bloglovin (Jo Booth / kiddyboo) I think my name is Jo Chester on Bloglovin because Jo Booth was already being used ! What is your favourite fruit or vegetable? Pretty much any fruit - it is all brilliant! That is so clever, I love it!